Watashi wo wasure sadanaide. Do not let me be forgotten. It made me think: What if all of my ancestors had said this? Both families on my parents’ side who perished 70 years ago in Hiroshima? I have a candle lit to remember them. I hope you will spend a minute to remember all those who perished in Hiroshima and Nagasaki. 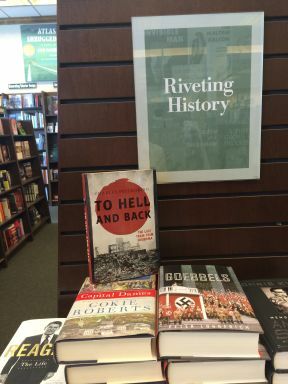 If you haven’t already, do read my dear friend Charles Pellegrino’s book: To Hell and Back: The Last Train from Hiroshima. This book, for the first time, made me realize that my ancestors are not statistics but real people who lived. In the Sacramento Bee yesterday, a letter to the editor states that President Obama must not bow when he visits Hiroshima this month, that a bow means an apology and U.S. must never apologize. destroying my home village, Kapoho. 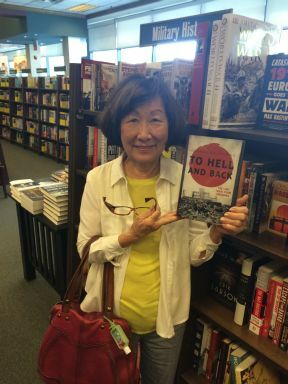 Below, I’m holding Charles Pellegrino’s book: To Hell and Back: The Last Train from Hiroshima at Barnes and Noble. The voices of the survivors of Hiroshima echo out of the pages. And yes, we are all Japanese, btw.